Connecting data from existing equipment and sensors to the cloud can be difficult at the best of times and impossible at worse. As many cloud-based software packages – such as energy monitoring and analysis, asset management, computer-aided facilities management and artificial intelligence/self-learning platforms – rely on accurate and real-time data from this equipment it is imperative that this data can be easily and securely integrated into this environment. Beckhoff’s EK9160 IoT coupler offers direct connectivity of I/O devices to the Internet of Things (IoT) without the need for a controller or prior programming. The coupler converts these signals into different IoT communication protocols and enables standardised integration of I/O data into cloud-based platforms and services. I/O data transmission can be parameterised in a user-friendly configuration dialog via the integrated web server, using any web-browser. The required cloud services and security functions (authentication, encryption, etc.) can also be conveniently configured using a browser. Following parameterisation, the coupler autonomously transmits the digital or analogue I/O values to the cloud service, including a timestamp. To safeguard against data loss in the event of network failures, a local buffer is used to ensure the integrity of the transmitted I/O data. The EK9160 coupler is Microsoft Azure Certified and AWS Qualified and enables communication with clouds based on advanced multi-cloud capabilities and supports all major cloud systems including Amazon Web Services (AWS), SAP HANA, as well as and private cloud systems in company networks. For data communication, the IoT Bus Coupler uses the publisher/subscriber communication principle. As a publisher, the EK9160 sends data to the cloud, enabling other applications to access the information as a subscriber. 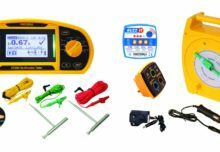 This application can then publish data itself if required, which in turn can be accessed by the IoT Bus Coupler. The devices do not need to know each other or individual IP addresses, rather only the central message broker, so the individual applications operate in decoupled mode. Communication for both the publisher and subscriber is always active and directed externally. Both of these factors mean that the firewall configuration and setup in the IT infrastructure of a company are simplified considerably. These advantages can be utilised in all areas of industrial engineering and building technology. Standalone solutions for small manufacturing systems as well as complex machines and building services systems are possible. The selected cloud system is not a critical factor here, given the option to choose a public cloud or a local solution in a company network. Depending on requirements, services offered by the cloud provider and individual tools or services from third-party providers can be used as needed. 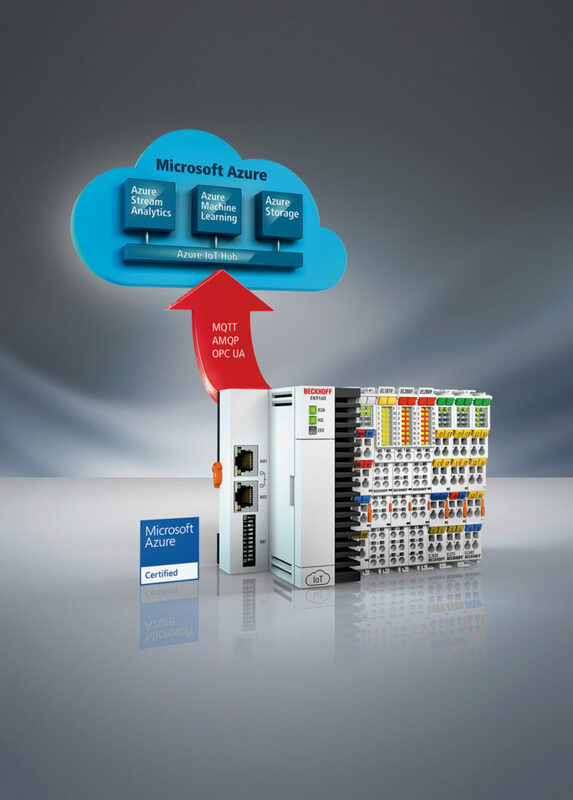 In conjunction with the portfolio of EtherCAT I/O terminals offered by Beckhoff, the EK9160 can be used to transmit the widest range of machine and building data types to the cloud, such as temperature, pressure, vibration or energy consumption. In addition, the concept of cloud-based control can be implemented using the IoT fieldbus. 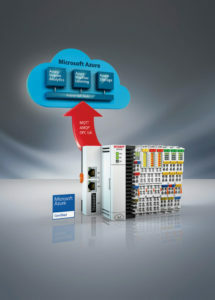 In this context, Beckhoff’s TwinCAT software can resides as a ‘virtual’ controller in the cloud and act as a message broker. The required data is supplied by IoT devices such as the EK9160 that can be installed in globally distributed locations, if required. In this application scenario, the IoT fieldbus, which has been implemented by Beckhoff based on the MQTT protocol, supports the necessary publisher/subscriber communication. As a result, all requirements can be fulfilled to simply and reliably relocate the control and data analysis processes to TwinCAT in the cloud.